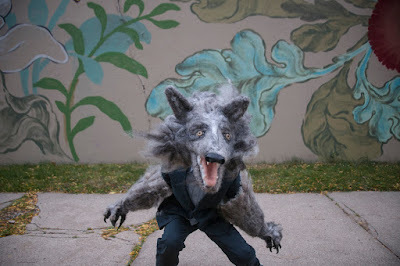 Werewolf in Sheep's Clothing | sweet juniper! 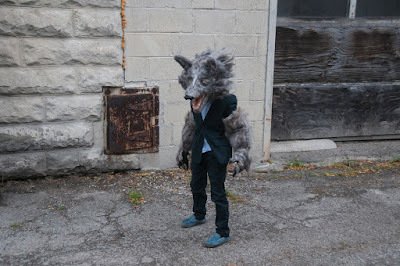 My son decided to be a werewolf for Halloween. 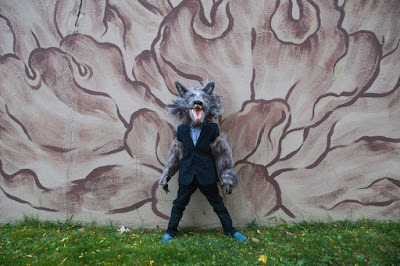 So I made him this mask out of felted wool. Then I made him those arms out of felted wool. 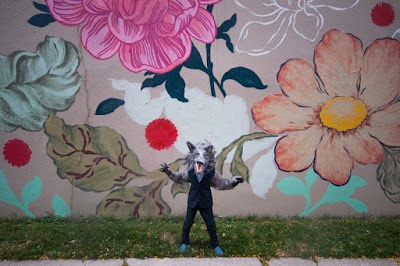 Then I made him wear his wool suit and take some pictures in front of a flowery wall. We go to all these fiber festivals every year and in the past there was nothing for me to look at unless the weird hippie who braintans his own sheepskins is there. But this year I had something look for---cheap wool rovings. The kids and I started needlefelting last year, which is an exhausting hobby where you sculpt lumpy things out of carded wool using a single barbed needle. If you stab the wool enough the fibers lock up and it felts and you can make just about anything with it. 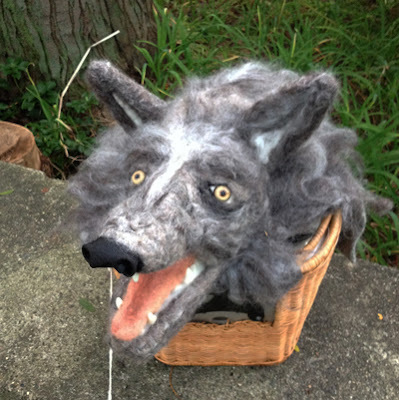 We make lumpy toys, mostly, but this year I bought a ton of gray roving to make this mask. 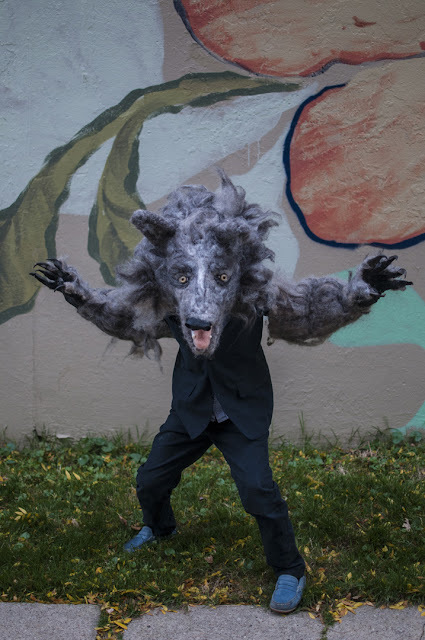 I terrified the neighborhood children for weeks sitting on the playground stabbing this decapitated wolf's head with a needle. It had to stab that thing a million times probably. It's very therapeutic. Well, get yourself an apple if you're still hungry. STAB STAB STAB STAB STAB STAB. I ordered a $6 coyote jaw and the glass eyes from the taxidermy supply house that sends me 625-page full-color catalogs twice a year. 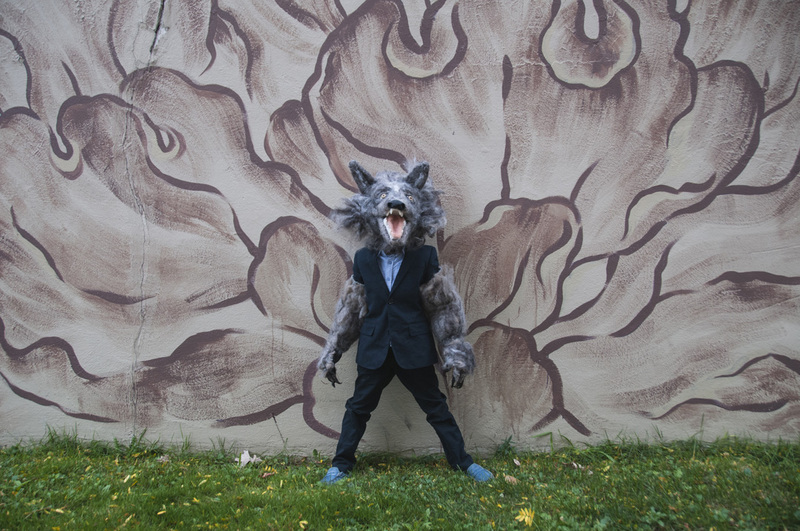 It's basically vegetarian taxidermy. I would say it's vegan taxidermy but then I googled to find out if vegans believe in wool and I learned that many vegans do not believe in wool to which I say enjoy that technicolor petroleum-based shiny plastic wardrobe for the rest of your life because you don't believe in animal haircuts, vegans. It's not really vegetarian either because I found a tiny scrap of stingray leather that looked exactly like that weird canine nose texture and I stuck that on the end, but I figure most vegetarians wouldn't shed a tear for a stupid stingray. It was a stingray, you may recall, that murdered Steve "The Crocodile Hunter" Irwin, and he loved all animals, probably even the stupid stingray that murdered him. He also swam in his full ranger uniform, including socks and shoes. If God knew how much awesome that stingray would take from the world, I'll bet he never would have let a pair of them flop their way onto Noah's ark. So I have all these shots of my werewolf son casually walking down the street in a suit and tie. I thought that was going to be the whole costume but then I had a bunch of extra wool so I started stabbing it into an old sweater to make him a werewolf chest and legs and a tail. Wool socks too. By Halloween night it was all dreading up with lots of leaves in the hair, just like that hippie who brain tans his own sheepskins at the fiber festival. 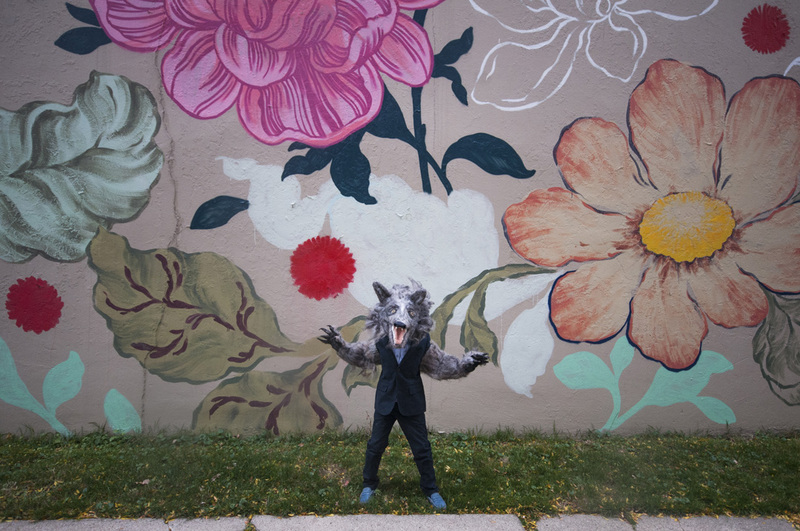 The mouth opens and closes but he likes it open so he can howl at the moon. 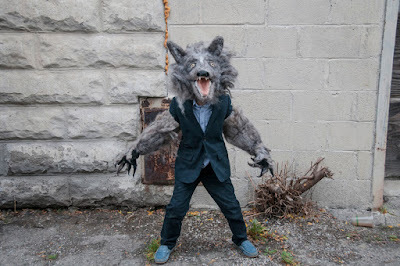 Twenty years ago in Dublin I lived across the street from a basement nightclub called Howl at the Moon that you had to enter through the jaws of a giant fiberglass wolf. I walked past it a thousand times and one night my roommate and I went down there and it was full of women as old as I am now who esnared us in their fetid shewolf-lair and fed us Bushmills and tried to get us to dance to "How Bizarre." I can't believe I forgot until now just how narrowly we escaped with our lives that night. 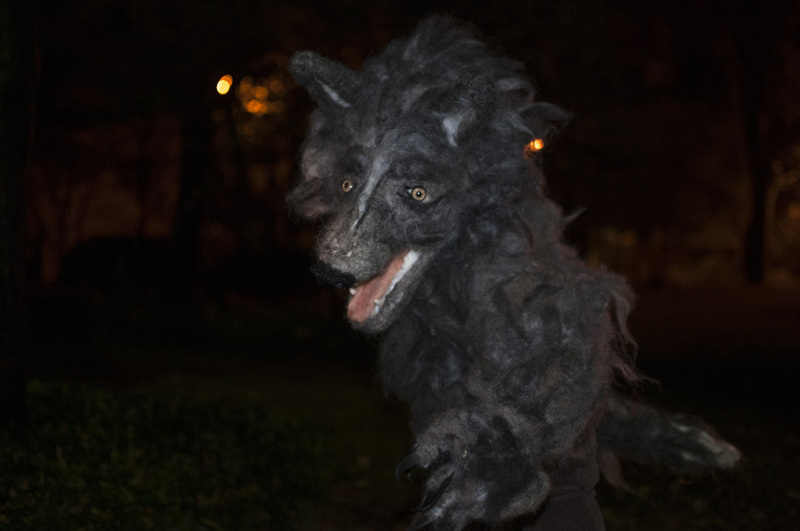 There was supposedly a full moon last week and every night we went out in costume to find it but stupid clouds. 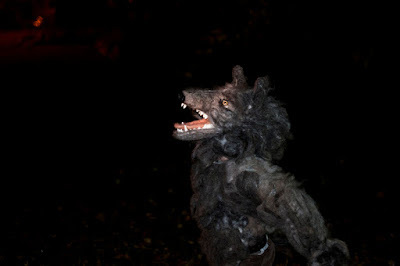 It wasn't exactly the most unique or original costume but it was what he wanted and he had so much fun growling and howling around Halloween night. 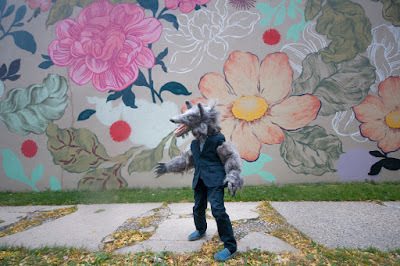 I think I might take the head and sew all the pieces together to make a wolf-skin rug to go on his wall. A vegetarian wolfskin, of course. Not a vegetarian wolf though. He eats hot dogs and chicken nuggets.